Why make homemade peanut butter cups rather than buy them? Of course, you have to think making your own candy is fun, but the real answer is in the ingredients. Ok ingredients will give you ok products. Better ingredients will give you better products. Then there are ethics and allergies to consider. I have written about my concern about the unethical sourcing of chocolate by many candy companies. All of the biggies that immediately come to mind when you think, “chocolate candy”, are guilty of unethical sourcing involving lack of fair trade and child slavery in cocoa harvesting. Ensuring my chocolate is ethically sourced is important to me. Happily, it’s very easy to find wonderful replacements for the chocolates made by brands I will no longer support. 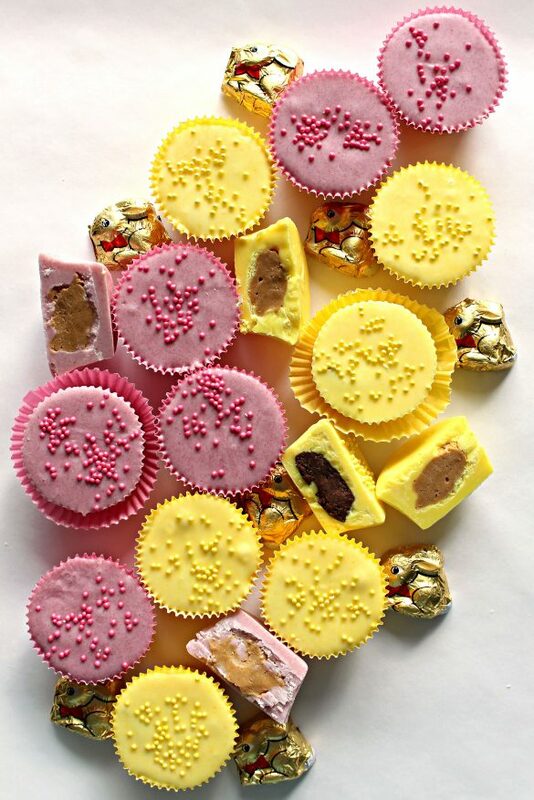 These Homemade Peanut Butter Cups are made with white melting chocolate from Chocoley.com. Their products are beyond delicious and all of their chocolate is fairly traded and ethically sourced. Another big plus is that Chocoley.com chocolate is produced free of the allergens my family is sensitive to, including tree nuts and gluten. 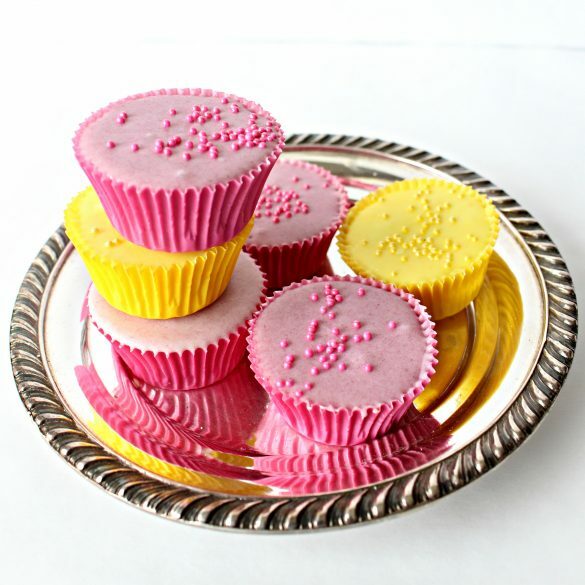 Another ingredient I loved using in these pastel treats was all natural food coloring powder from Color Kitchen. (This not a sponsored post. I’m just enthusiastic about the product!) Their coloring doesn’t work in all applications, but I like having the choice of a natural color when possible, like in the colored powdered sugar on my Soft Almond Cookies. The Color Kitchen powders seem to produce the most vivid colors when they are not baked. The natural colors work well for frostings, marshmallows, and coloring white chocolate. 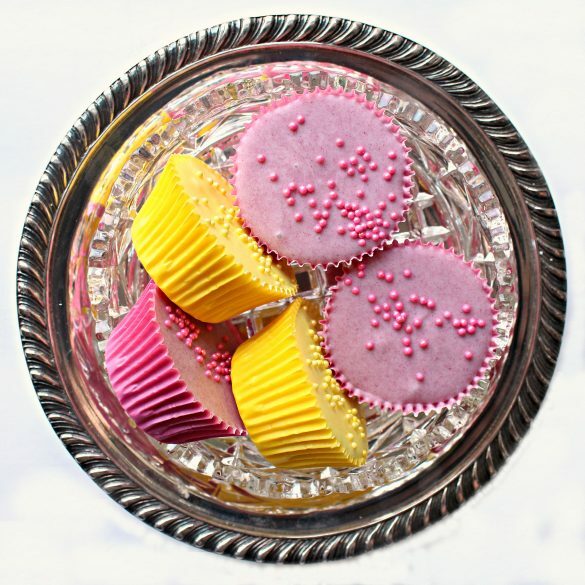 However, I did use the natural colors in some Easter cookies, coming to the blog soon, that I think are beautiful in their muted tones. Whether your ingredient concerns are similar to mine or different, the bottom line is that homemade gives you control and choices. In this case the result is a special spring-colored treat that will wow all of your care package or Easter basket recipients! Making your own gourmet candy is easy! There are no special molds or equipment needed. Adding color to white chocolate is optional, but the burst of color is sure to make white chocolate peanut butter cups the star of any Easter basket! 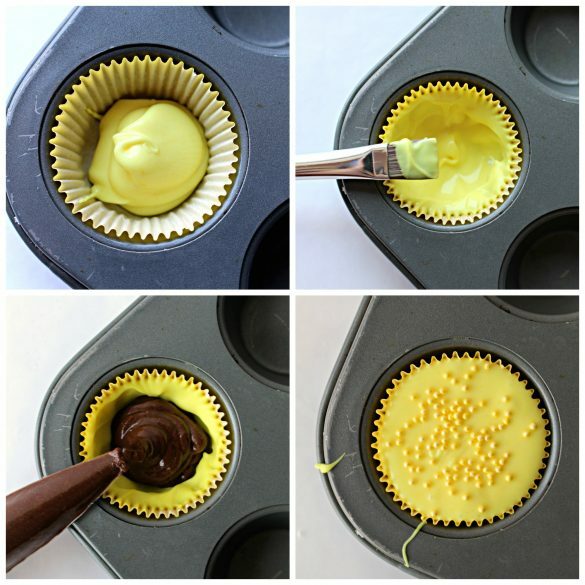 Prepare a mini muffin pan with 6 cupcake liners. Mix peanut butter with confectioners’ sugar and place in a disposable piping bag (or ziplock bag). Melt the white chocolate over a double boiler or in a microwave at 50% power. Every microwave is different so watch your chocolate carefully. Add coloring to the melted chocolate and stir until uniformly colored. Spoon about 1 ½ – 2 teaspoons of melted chocolate into a cupcake liner. Use a small food brush to coat the sides of the liner with melted chocolate, moving some of the chocolate from the bottom of the cup up the sides. Repeat with the remaining 5 cup liners. Chill the shells for about 7 minutes. Microwave the peanut butter filling for about 30 seconds to soften and make piping easy. Fill each shell with about 1 teaspoon of filling. Top with additional melted chocolate and tap pan on the counter to make the tops smooth. Chill about 15 minutes until firm. The biggest bonus from making your own peanut butter cups, is that you have control of the ingredients. That choice allows for the best quality and ethically sourced ingredients. Melt white chocolate carefully! It burns and gets clumpy quickly when overheated. The most cautious method is melting in a double boiler, mixing constantly. If melting in the microwave, use 50% power and stir frequently. For coloring white chocolate, use only oil based candy coloring or powdered coloring. Chocolate will seize (get grainy and thick) when mixed with water. Do NOT use regular food coloring gel, as it is water based. This recipe can also be used with dark or milk chocolate. 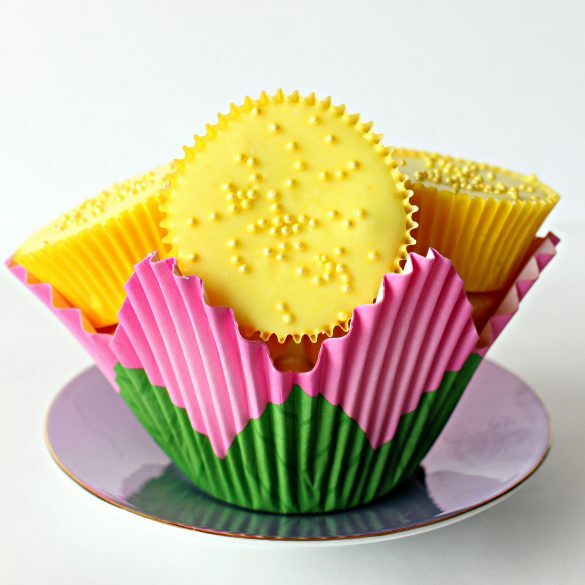 For a burst of color use sprinkles or a drizzle of colored white chocolate. The filling can be made with any nut or seed butter, chocolate nut butter, or soy nut butter. Additional confectioners’ sugar may be required to thicken the filling if the nut/seed butter is runny. 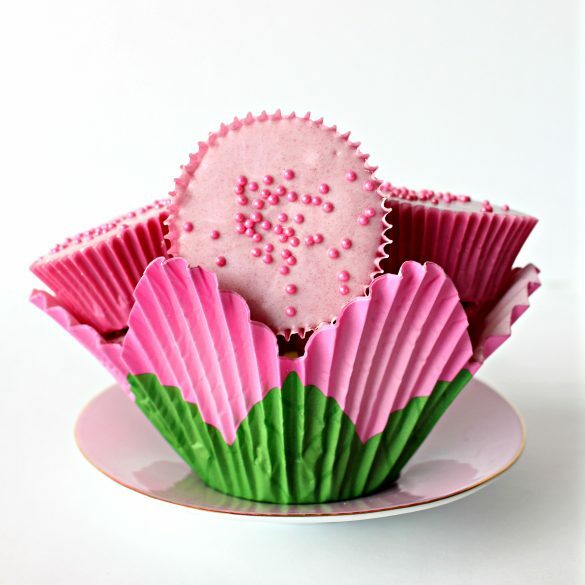 Deep plastic and silicone molds can be used with this recipe in place of the cupcake liners. Remember that chocolate will melt when shipped in warm/hot weather. Homemade peanut butter cups are the way to go for an amazing chocolate treat! Adapt the ingredients for flavor and variety! These beauties may look fancy, but they take only minutes to create! In a small mixing bowl, thoroughly combine the peanut butter, confectioners’ sugar, and vanilla until the consistency of play doh. Place the filling in a disposable piping bag (or ziplock bag). Set aside. In a small mixing bowl, microwave the white chocolate at 50% power for 1 minute. Stir and continue microwaving at 50% power for 20 second intervals until completely melted (approximately 2- 2 ½ minutes total). Every microwave is different so watch your chocolate carefully. Remove the melted chocolate from the microwave and add coloring, stirring until uniformly colored. Spoon about 1 ½ - 2 teaspoons of melted chocolate into a cupcake liner. Chill the pan in the refrigerator until set (about 7 minutes). Microwave the peanut butter filling for about 30 seconds to soften and make piping easy. Snip off the tip of the piping bag or a corner of the ziplock bag. Remove the pan from the refrigerator and fill each shell with about 1 teaspoon of filling. Microwave the colored chocolate 20-30 seconds at 50% power to soften. Spoon additional melted chocolate on top of each cup and tap pan on the counter to make the tops smooth. Chill in the refrigerator about 15 minutes until firm. Store peanut butter cups in an airtight container at room temperature for up to 2 weeks. Refrigerated peanut butter cups will stay fresh longer. No chocolate candy should be mailed during warm/hot weather. To ship during cool weather, wrap each peanut butter cup in plastic wrap then stack in a freezer weight zip lock bag. Peanut butter cups are my all time favorite treat! Something about that combination of flavors really draws me in. 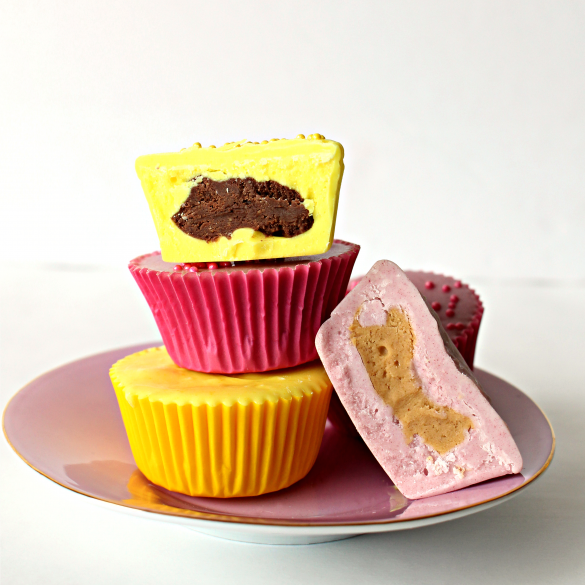 These are the prettiest PB cups I’ve ever seen Wendy – bravo!